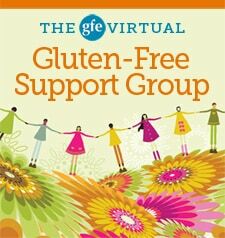 Welcome to the May GFE Virtual Gluten-Free Support Group (VSG) meeting! If you’re new to GFE VSG, it’s the online event where I share information from my actual support group meetings with all of you. That includes information on the presentations, the food shared, tips from my members … anything that comes out of the meeting that I think you will find helpful. Sometimes I’ll also add additional pertinent information to my GFE VSG post that we might not have had time for in our actual meeting or maybe even information that came up or was investigated further later. As part of your participation in our VSG, I ask that you interact with all of us joining in to the GFE VSG by commenting on the presentations, gluten-free recipes, and any of the shared info and offering your own input. Usually there is a linky via which bloggers can link up recipes, but I’m foregoing the linky this month as it has not been working well for everyone. If you have a recent recipe that you’d like to “bring” to our VSG, just tell us about it in your comment or leave a link to your post. Hopefully, we can re-instate the linky feature next month. Last, there is also a giveaway each month! Giveaways always tie into the topic of the meeting and/or the food theme. Anyone who leaves a comment will be entered. Only one comment is required (and only one will be counted), but folks are welcomed and encouraged to have discussions with each other in comments. Our meetings start with our shared meal. Let’s get to it! Food: We had a tasty, “true” potluck for our last meeting with Crockpot Jambalaya; Venison Sausage (my version of this recipe) with Lydia’s Caramelized Onions (another crockpot recipe—easiest way to make caramelized onions … ever) and Sautéed Mushrooms; Veggie Rice Salad (see photo); Beef, Sausage, and Quinoa-Stuffed Red Peppers (see photo); Great Salad with Homemade Poppy Seed Dressing; Green Pea Salad with Vinaigrette Dressing, Blackberry Pudding Cake (see photo); Brazilian Un-Cheese Rolls; Flourless Peanut Butter Cookies; fresh pineapple and strawberries; and more. 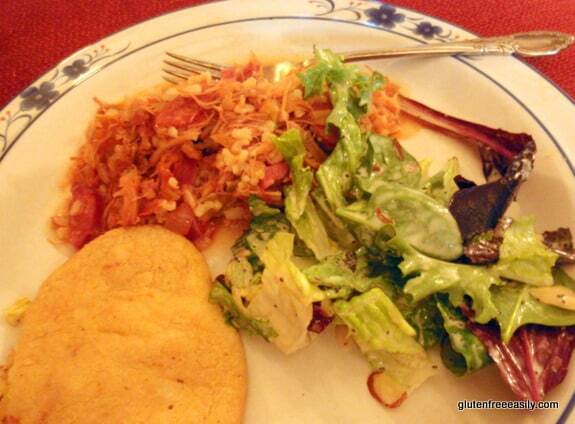 On my plate shown below, you’ll see Crockpot Jambalaya, Great Salad, and a Brazilian Un-Cheese Roll. It’s wonderful to have such a variety of food at our meetings. 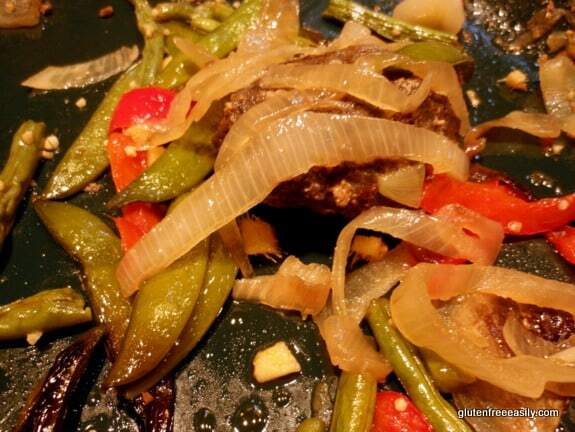 Everything is gluten free, most foods are dairy free, and some are vegetarian or vegan, too. Presentation: Our meal was followed by a great presentation by Tricia Thompson via teleconference. 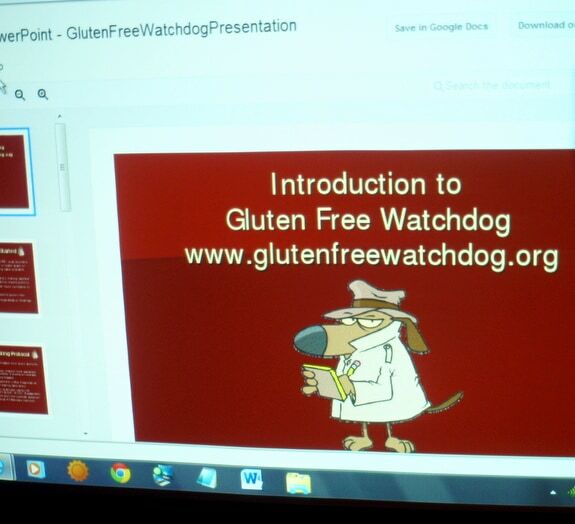 Tricia had forwarded her presentation on the Gluten Free Watchdog program, which she founded and operates. Tricia is one of the most respected in the gluten-free community for her extensive knowledge and sharing of her knowledge with the gluten-free community. You may also know Tricia as “The Gluten-Free Dietitian” or remember her informational posts on the celiac listserve if you’re a member of that group. 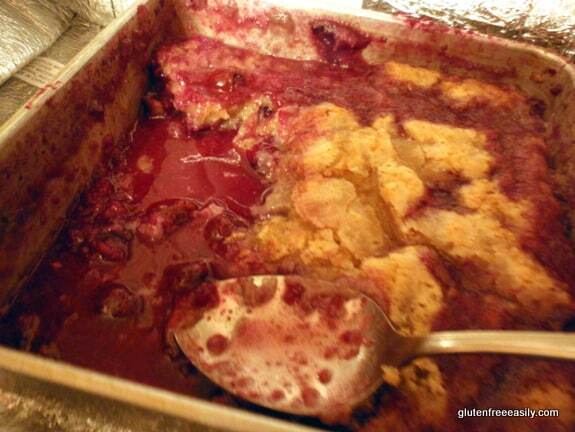 Tricia also has written her own “expert” blog, Living Gluten Free, over at diet.com. Tricia spoke previously to my group several few years back. 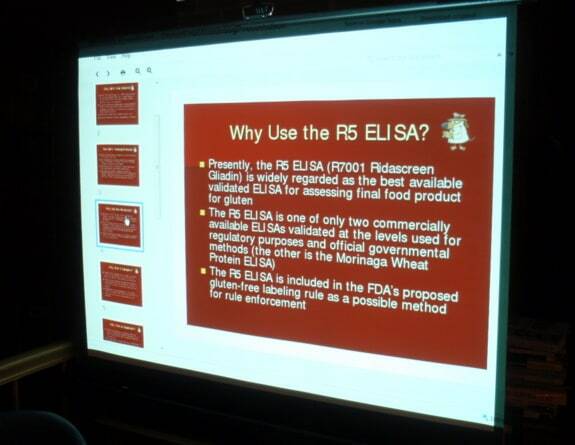 At that meeting, she talked about her part in testing mainstream oats (critical testing which established that mainstream oats are highly cross contaminated and not safe for those on a gluten-free diet; always use certified gluten-free oats) and the lack of nutrition in processed gluten-free foods. I’ve actually looked to Tricia for her expertise on a number of topics over the years: gluten-free labeling specifics, the presence of gluten in naturally gluten-free grains, (and explained further here), to name a few. The Gluten Free Watchdog tests several products weekly to see if they actually are “gluten free.” Products are tested in the following categories: tortillas, cookies, hot cereals, and breads. For each product, three samples are tested. If the product tests positive for gluten the level of 20 parts per million (ppm) or more, Tricia contacts the company and sends out an alert to the public via the Gluten Free Watchdog site and numerous other public forums like the celiac listserve, Facebook, and Twitter. You can see Tricia’s whole presentation here. She shares some of the surprising things that she has learned since starting the program; e.g., unbelievably, many manufacturers did not know that including barley in a product was not allowed in gluten-free products. Most importantly, you can see the product alerts that she discussed here. There are only a few shown, but if you are eating even one of the products listed, it’s critical that you read these alerts and stop consuming these products until they are retested and determined to be gluten free. That is, if the company decides to improve its process to ensure gluten-free products. Very disturbingly, one of the products that tested positive for gluten is a product that has been certified to be gluten free to less than 10 ppm by the Gluten-Free Certification Organization (GFCO). In actuality, the product tested far higher than even the proposed 20 ppm level. Please take a moment to see if any products you consume are on the Gluten-Free Watchdog Alerts page. It’s also very nice to receive testing reports and find out that products that you are consuming are gluten free. As Tricia shared, most of the products that the Gluten-Free Watchdog has tested have been found to be gluten free to less than 5 ppm. That’s an important distinction to note. Gluten Free Watchdog testing is done to the less than 5 ppm level, but alerts are only issued if the product tests at 20 ppm or above–the current level that is proposed for a “gluten-free” label by the U.S. Food and Drug Administration (FDA). I am one of the super sensitive, and while I use very few gluten-free products (other than naturally gluten free, real food), I very much appreciate getting my Gluten Free Watchdog reports. They come often … at least once a week. Since subscribing to the program, I have seen that products that I occasionally use have tested to less than 5 ppm and I have seen that a few other products, as already noted, have tested decidedly not gluten free. The latter information is critical even for someone like me who uses few products as I might be at a friends’ home and she has graciously picked up some “gluten-free” tortillas for me or I might be at a conference that is providing gluten-free products for gluten-free attendees, or I might just want to try something new. Knowing the Gluten Free Watchdog testing results to date has already prevented me from getting “glutened” in such situations more than once, which makes the program worth so much more than its small monthly subscription fee. It’s an understatement to say that I am a huge fan of this program! I wish that there was no need for the Gluten Free Watchdog, i.e., that gluten free always meant gluten free, but that is not the case, so the Gluten Free Watchdog’s services are greatly needed. For less than it costs to buy one gluten-free product a month, you can subscribe. Subscriptions are $4.99 a month and you can stop your subscription at any time. Subscribers get to see the actual tests results, not just a “pass” or “fail,” so to speak. 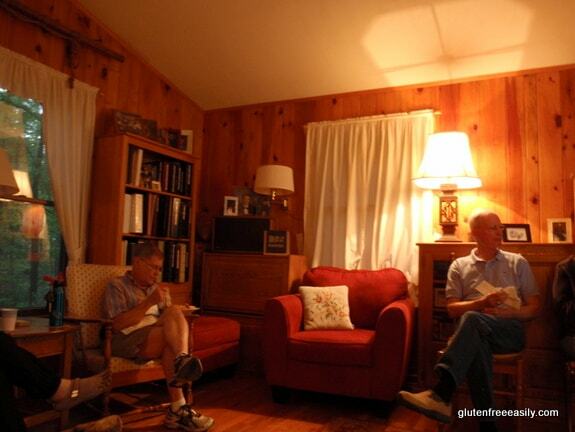 The reports show whether products that tested “gluten-full” contain 20 ppm or 700 ppm gluten. Of course, either level will harm someone who is gluten free, but I think it’s important to see actual test results and know when a positive result was not just over the proposed limit by a small amount. It’s all too easy for folks to rationalize that their favorite products still might be safe … to think that a reading 20 ppm or 25 ppm would still probably be okay for them. That’s simply not the case, but we humans can sometimes play surprising mind games when it means giving up favorites. Or individuals might rationalize that the readings were total anomalies. That’s why Gluten Free Watchdog shares any follow-up testing data and information from manufacturers, but also does follow-up testing itself. “The policy of Gluten Free Watchdog is to retest products that have tested at or above 20 ppm gluten within one year of the original test date.” That means the Gluten Free Watchdog program gives manufacturers an opportunity to resolve their issues, but re-tests to determine if the gluten-free consumer is now being offered a truly gluten-free product. Subscribers have access to all test results from the moment they join the program. However, subscribers are not allowed to share any of the information with others. That’s why alerts are shared in public forums on products that do not test gluten free. Subscribers get the news on products that test positive for gluten immediately, and again, they get the specifics. In addition, subscribers can request that certain products be tested. For example, if I reacted to product X, I could request that the Gluten Free Watchdog test product X in the future. All in all, this program is a great one and much needed to keep us all safe if we’re consuming any “gluten-free” products. Giveaway: Tricia Thompson has generously donated two three-month subscriptions for two gfe winners. Simply leave a comment to enter the giveaway. This giveaway will end Sunday, May 13, at midnight Eastern. Last, please come back at the beginning of next month for our next GFE Virtual Gluten-Free Support Group, featuring nutritionist and personal trainer Donna Hetrick with her presentation on Healing the Gut. And don’t forget to come back tomorrow for Part II of They Just Don’t Understand: Strategies for Dealing with Friends and Family. You can read Part I here. UPDATE: I want to announce the winners of the two three-month subscriptions to the Gluten Free Watchdog program. Congratulations to Amber (The Tasty Alternative) and Cindy W.! You can read their comments below. Great VSG this month!! Thank you for introducing me to Tricia and The Gluten Free Watchdog! I would love to win a three month subscription! And thank you for including a link to the presentation. I’m so shocked to learn about this ignorance within companies (claiming to be GF) – I mean, really…barley?? come on people! This is eye opening Shirley. This week I am sharing Strawberry Cantaloupe Popsicles (sugar free). Thank you for introducing me to Tricia and The Gluten Free Watchdog! I would love to win a three month subscription! Hi Amber–I’m so glad to introduce you to Tricia and her invaluable Gluten Free Watchdog program! 🙂 Will be announcing the winners of the subscriptions shortly. Yes, we were all shocked at the lack of knowledge that can be behind a “gluten-free” label. I am SO glad you’ve shared information in the past on the program. It explained why I was feeling glutened when I knew I hadn’t consumed gluten, knowingly. I check the site regularly now. Like you said, it’s helpful to know what is testing safe and what isn’t ahead of time (when possible). Thank you for sharing more for this month’s Virtual Support Group! Wow, scary that a certified GF product tested positive! I do not purchase a lot of processed foods, but when I do it is usually GFCO because I am so sensitive to gluten. I tossed around the idea of subscribing to GlutenFreeWtchdog, now I think it is a must! Thank you Shirley or a great support meeting! And as always for bringing us the best information! Another great monthly GF support group post! Such a great spread of GF food too! Thank you for the information. I don’t use very many gf products but, like you, am exposed to them some of the time by family or friends. A free subscription would be very nice to have. I love being part of your virtual support group, even if I am participating behind the scenes all the way out here in Colorado. You have such a flair for hospitality, even from afar. 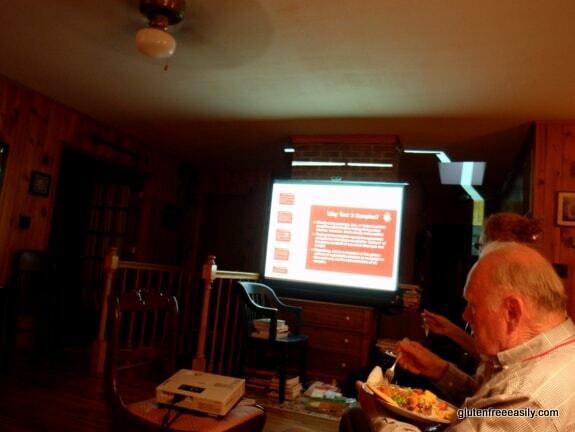 Great set-up you have with the screen and projector! Wow, gluten-free food and entertainment. What a great combo! Thanks for inviting me into your home, Shirley. It’s been a fun visit. I actually plan to visit someday IRL. It is on my to-do list and although my time is at a minimum right now, when my schedule eases up, I’ll be out your way. And if you want me to do a presentation at your support group meeting (IRL), I’d be more than honored to do so. Seriously honored! We’ll make it happen one of these days. I know that! 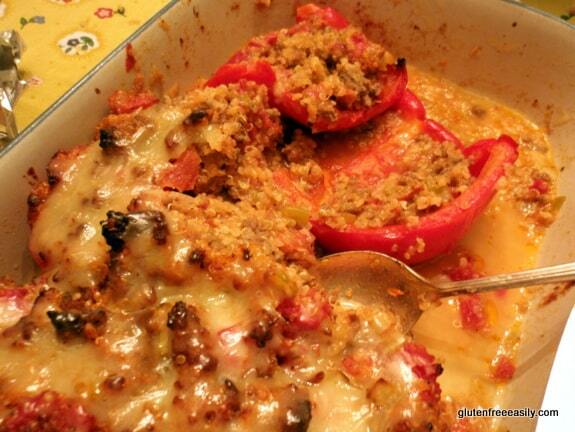 Thanks for sharing the interesting presentation and recipes. It is too bad we need a watch dog organization but until we don’t – I am grateful. I WOULD LOVE TO RECEIVE THE THREE MONTH OF WATCHDOG PRESENTATION. I WAS TO SEE THE DR. TODAY AND VOMITING AND DIAHERA PERSISTS. Hey Carole–Will be announcing winners later today. I’m so sorry that you are still having issues. There can be so many causes for continued problems, but certainly continuing to get gluten from an unexpected source is the #1 reason per Dr. Cynthia Rudert. After that come other secondary conditions and other food intolerances. Hoping you will have answers and optimum health soon, dear. Thanks for these wonderful posts! As always Shirley, you are amazing!!! Regardless of whether I win or not, I’m signing up…..you made such valid points in your blog. My days of “overlooking” are gone, but I have very well intended friends that I have on many occasions said thanks, but declined their loving efforts and offers. One day I look forward to meeting face to face again……I have so many questions!!! 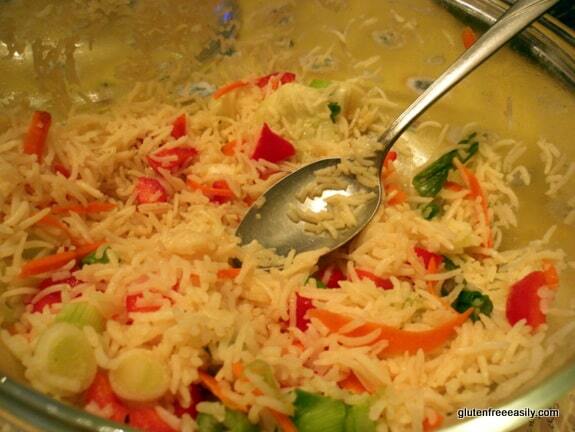 With love….Namaste!! Oh my goodness Shirley! I need to fly out just for the food! So amazing that you organize such a wonderful meeting every month. Your town is lucky! Once again, the food looks delicious. Wish I could be there. (: Thanks for the great information, Shirley. Hi Cindy–Thanks, dear! 🙂 Maybe on day, you’ll come to VA? 😉 Are you getting ready for summer break or does your preschool go year round? This must have been a very interesting meeting! In January this year the UK introduced new laws regarding the labelling of gluten free foods both on packaged food and in restaurants which is going to be a huge help to all of us in the UK, I suppose there must be some sort of organisation geared up to regulating this! The watchdog seems to be such a great idea, so useful to the public! And the food looks wonderful too! Hi Vicky–There are lots of organizations in the U.S. whose interests lie in protecting the gluten free, but establishing and policing the regulations here falls to the Food and Drug Administration. We’re supposed to get out “gluten free” labeling requirement law this year. We’re eagerly waiting! Yes, the Gluten Free Watchdog is a very valuable program. Thanks for the info, I keep meaning to get a subscription to gluten free watchdog, so winning one would be great. Thank you for this informative (and did I mention fantastic?!) event each month! I would love to win a subscription to Gluten-Free Watchdog. There is no gluten in our home, but my husband who has celiac still gets sick from even trace amounts of gluten which is really hard on him. Hi Laura–You’re a dear–thank you! Yep, trace amounts of gluten do many of us in, myself included. That’s why I’m so grateful that the Gluten Free Watchdog tests to less than 5 ppm. Will announce winners later today. Thank you, Shirley, for this really informative post. The food looks great and you are such a welcoming hostess. I would love to win one of the subscriptions so I can share the info with our support group. We just had our first potluck this past Monday. Thanks for the inspiration. Hi Pamela–Thanks so much! The rules of the GFW will not allow sharing with even your support group, but if you won a subscription, you could certainly alert them when the alerts were posted for the public. Shirley, what a great way to share information. Thank you for putting forth the effort to introduce this “virtual” event – you continue to help so many, through your actual support group meetings, and now your virtual ones! Happy Mothers Day to you. I got the best Mother’s Day gift ever … our son graduated from college the day before! I am very excited to hear I won a 3 month subscription to the Watchdog report. 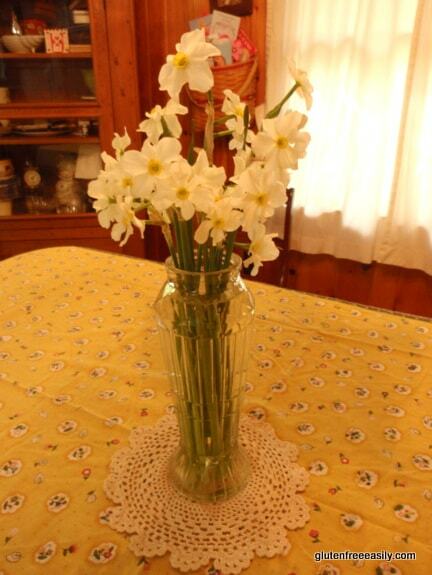 Thank you so much, Shirley! It should be very helpful. I was surprised to read (on your blog) that the Watchdog had discovered the tortilla wraps I had been eating daily for lunch had tested higher than the allowed amount. Needless to say, I stopped eating them. Thank you again. I just love all the info you share with us.